You say Eid and the first thing that comes to mind is Sewain. Like me, there are many people who would wait for Eid to have this Qemami Sewain. If this dessert is not cooked properly it is a big turn down; I’ve seen people making very sticky and sometimes dark brownish Sewain. I would say a no to it. Although it’s all about taste, the way Sewain looks, matter too. There are two types of Sewain you will easily find at the homes of Muslims, Sheer Sewain and Qemami Sewain. Sheer sewain is made from milk while Qemami is made with Khoya, dry fruits and water. This is mom’s Sewain recipe which I’m carrying along. Many of my friends and family who have visited my home, especially on Eids, will surely confirm the absolutely yum taste of this dessert. First thing I want to share is, I prefer slightly reddish orange sewain; it looks beautiful and your friends will praise you! The other thing that is important in making sewain is the right proportions of all the ingredients. From the below-mentioned ingredients for Sewain, you can make this dessert well-balanced in sugar. However, if you prefer much sweeter sewain, you can add 250 gm sugar more; this applies only if you prefer much sweeter sewain. In a wok, add a tablespoon of pure ghee and heat it. Add chopped dry fruits and roast till light brown. Keep it aside. Likewise, roast, desiccated and shredded coconut and makhana separately in ghee. In a big pot add pure ghee. Heat it for few seconds and add cardamom pods to it. Roast for 10-20 seconds on high flame. Now add the water as mentioned in the ingredients’ list. In a separate bowl, take two teaspoons of water, mix the orange food colour with it and add to the water pan kept on the flame. Bring it to boil. Now, add sugar, chopped and roasted dry fruits (save some for garnish) and khoya or mawa (thickened milk). Cover the lid. Cook further for 30 minutes on low flame. Now, put off the flame. Take off the pan from the gas stove and keep it aside. 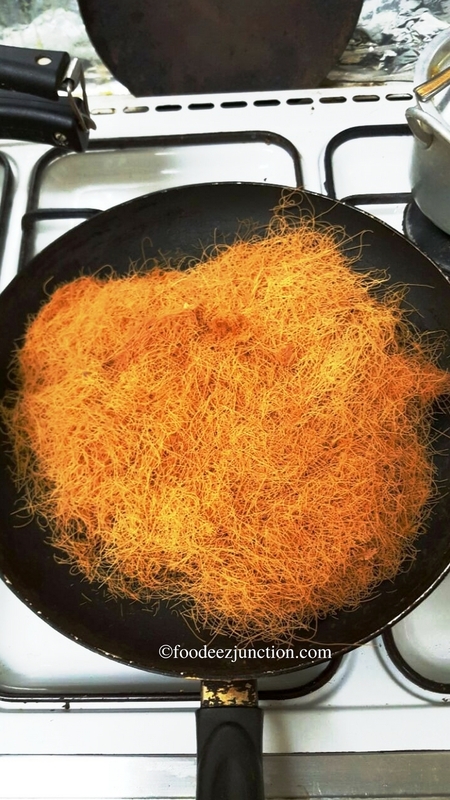 Right after 10 minutes, open the lid and spread all roasted sewain (vermicelli) over the sugar syrup. With light hands stir and again close this lid for 30 minutes. After 30 minutes, open the lid. Let it cool. Take out the Qemami Sewain in a serving bowl, garnish with desiccated coconut and the remaining dry fruits and serve to your guests. The Sheera or sugar syrup shouldn’t be thick. It should be flowy. Don’t add too much colour else it will make your sewain bitter. If the Sewain isn’t roasted, you won’t get the perfect taste. Use the roasted sewain. If not available, then dry roast at home and then use it in making the dessert. Yea right..I saw it later.it want loading initially in the posts section.thanks for replying…um.. the sewain have known r exactly the same with lots of khoya & nuts like u have made except that it’s dried!! Ohh… we usually do not prefer the dried ones at home as it tastes slightly on the raw side. If you want the recipe for the dried sewain, you just need to thicken the sugar syrup. But try this one. I hope you’ll like this one too. Enjoy!! U haven’t shown the final picture!! It’s right there. The first pic in the recipe post and in the slideshow under the heading add roasted sewain.